“Welcome to the sunniest town in Finland,” said our lovely guide Tarja. 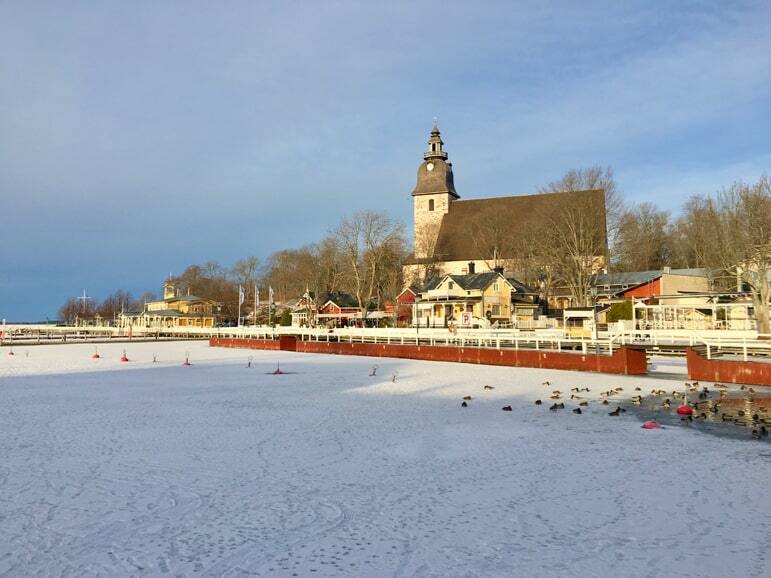 We were in the small southern coastal town of Naantali, one of the oldest in Finland. It is the official summer residence to the Finnish president, while Russia’s president Putin is also a regular visitor. The town’s charms were immediately apparent, even to us lesser political mortals. And yes the sun was shining, even though the temperature was well below freezing on the January morning. 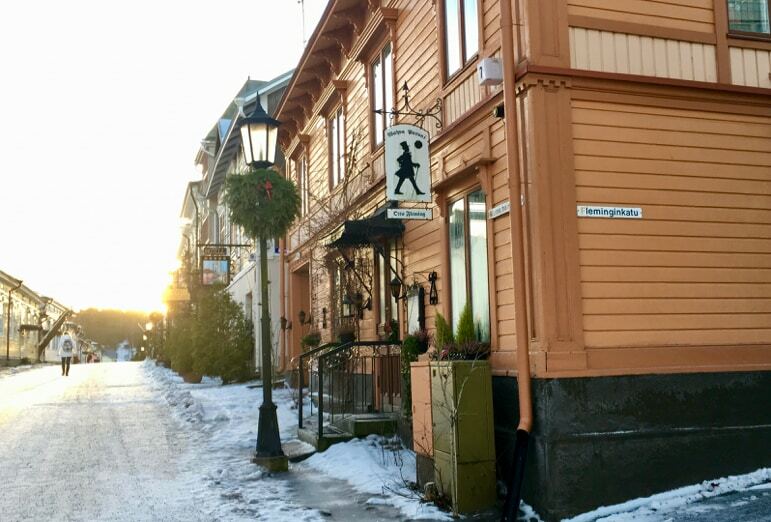 As we walked around the quaint little town centre, we came upon many 17th and 18th century wooden buildings, which give Naantali a historic, but distinctly relaxed feel. 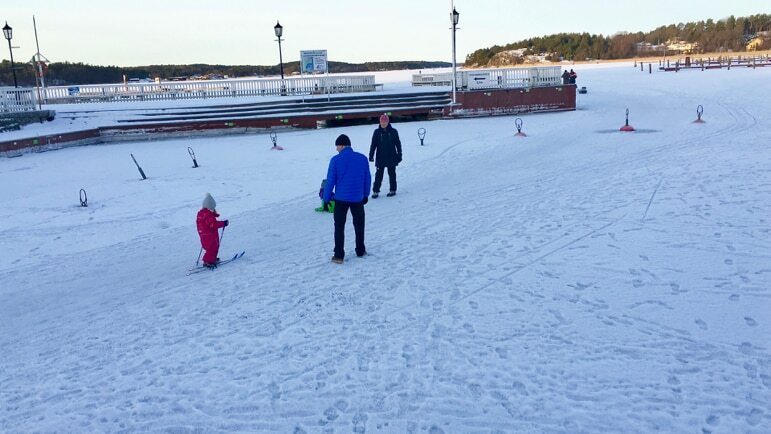 Out on the frozen Baltic Sea, local people took a breezy walk, parents taught their toddler to ski (cross country of course), people skated and a few more cut holes into the ice to dip fishing rods deep beneath the surface to find water and fish. It was a very different scene to what we’re used to in a land-locked region of the UK. And the colour and scenery, even on the winter’s day on which we visited, was mesmerizing. Naantali is a very lovely place in which to while away a few days. In need of a snack we headed to Café Amandis, which has a lovely location right on the sea front it also claims to have the world’s best waffles. Now, that is quite some boast and we felt the need to see if the claim lived up to reality. Welcoming us into the warmth of the cosy cafe, the owner’s daughter guided us to our table. We wasted no time ordering our waffles, whose secret recipe was created by their chef. And a thing of beauty was delivered. 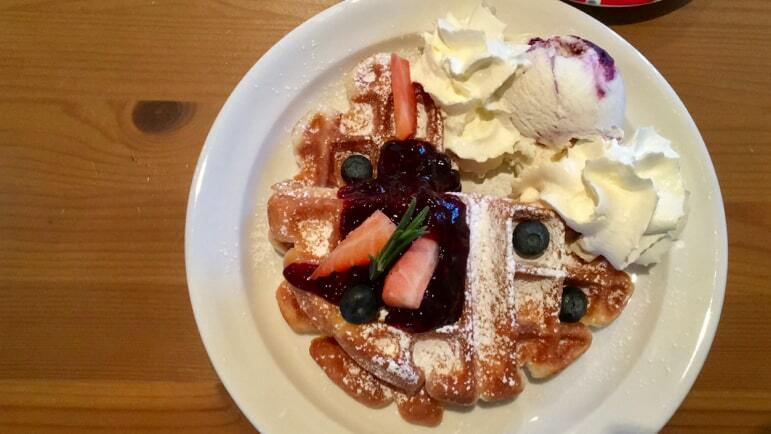 A very large waffle base was smothered in fresh cream, ice cream, blueberries, strawberries and a dusting of icing sugar. The verdict? Well it’s the best damn waffle we’d ever tasted, a true gastronomical delight. A mental note was made, we must return for more some day – they come with a range of toppings and we intend to try them all! 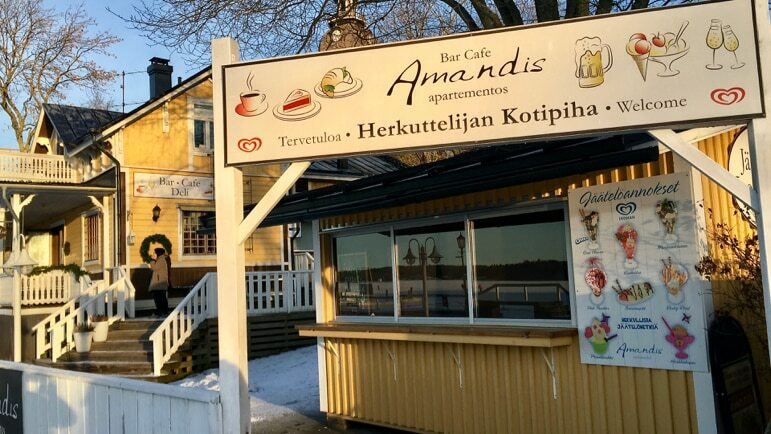 As good as they were, Naantali isn’t famous around the world for its waffles. But it is famous as the home of a certain family of children’s TV characters. Crossing over the bridge from Naantali to the island of Kailo, we arrived at Moomin World. Sarah had some knowledge of the Moomins, I must admit I had never heard of them before my first visit to Finland, but I am clearly in a minority. 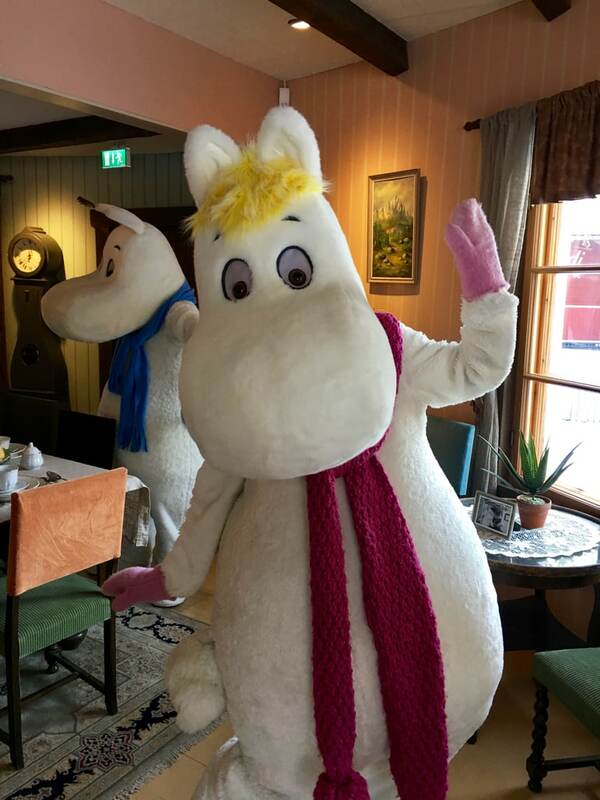 Based on the books by Finnish novelist Tove Jansson, they are hugely popular across northern Europe and also Asia. 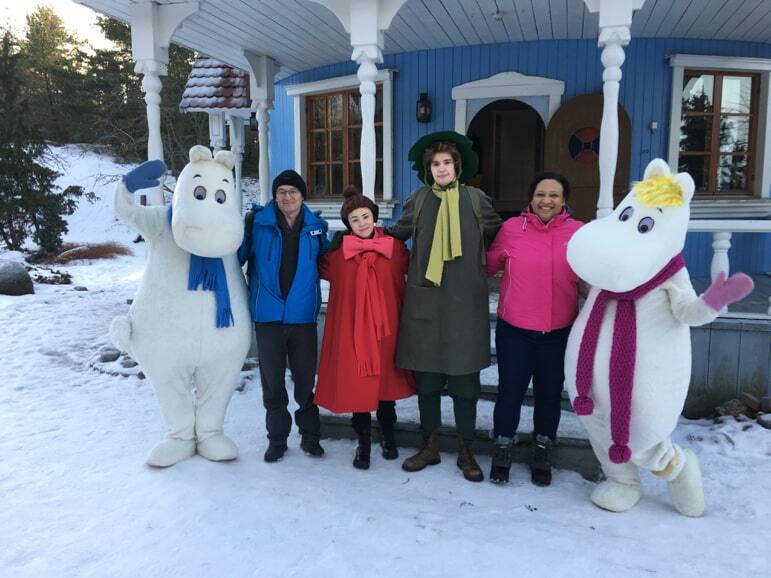 Four of the characters gave us an exuberant children’s television welcome and took us to the colourful Moomin House, a five-storey lighthouse-shaped home, in bright blue. If you are familiar with the Moomins you will also appreciate that next door is a yellow house belonging to Hemulen. 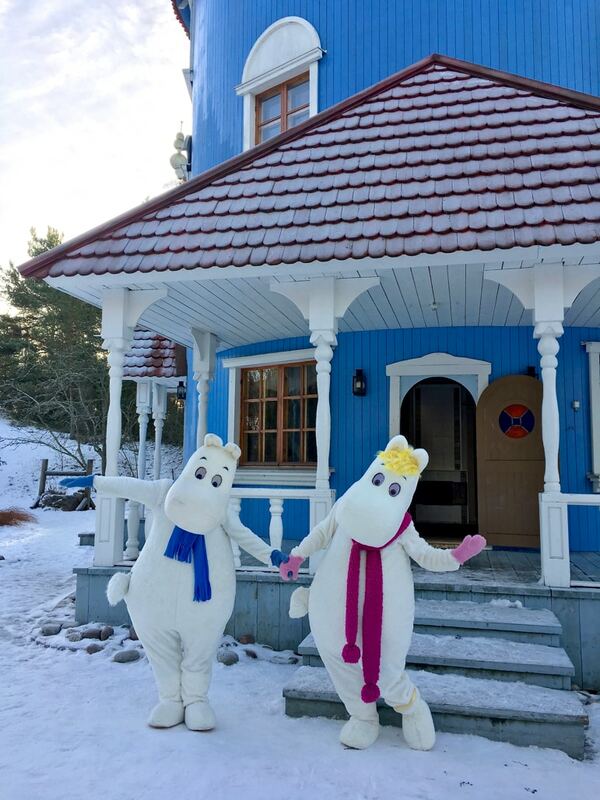 While other landmarks you can visit include Moominmamma’s kitchen, the fire station, Snufkin’s Camp, the wishing well, Moominpappa’s boat and the Witch and Alice’s cottage. The theme park is slightly unusual as there are no rides, but instead it has a great many activities and fantasy walks for children including Toffle’s Path with Witch’s Labyrinth, The Hattifatteners’ Cave and The Groke’s House. There is also the outdoor Theatre Emma where performances take place. 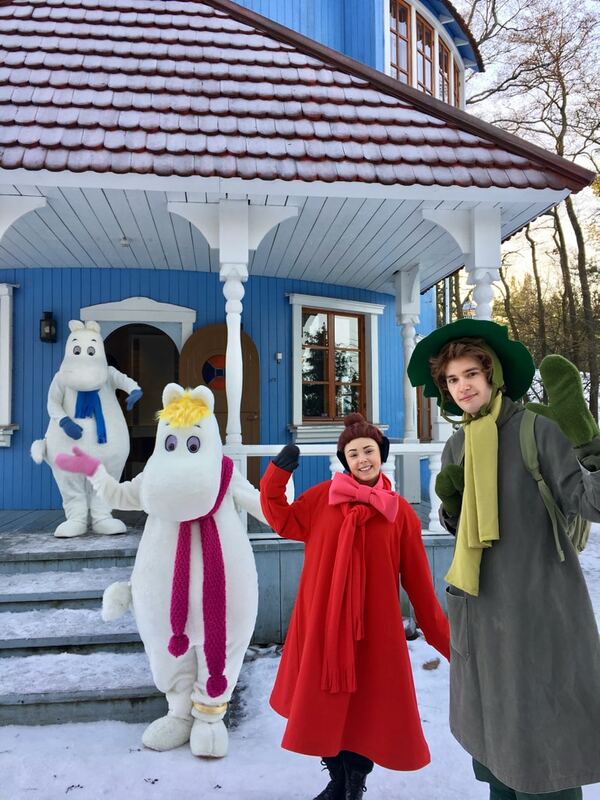 The Moomin World should have been closed (Moomins traditionally sleep in winter but they kindly took a break in their hibernation to greet us). 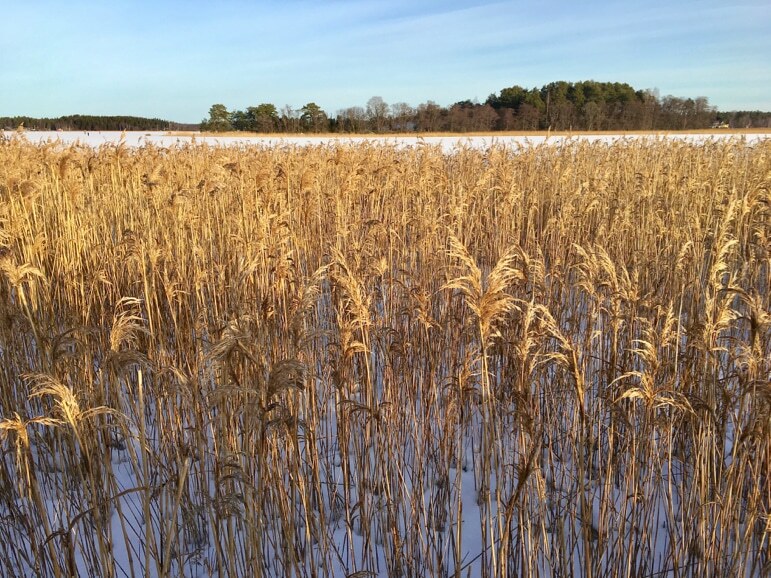 However, if you want to visit head there during the glorious Finnish summer – it opens daily from mid-June to mid-August, or during an eight day period in February. 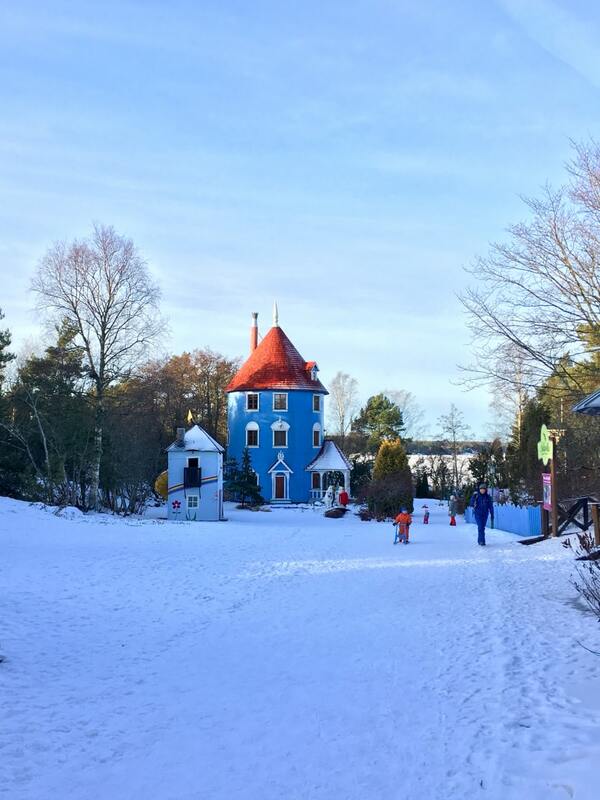 Naantali is crowned by its 560-year-old church and we’d heard about an unusual tour, so we crunched our way across the fresh white snow to take in a very cultural experience. Songs of the Sisters is a beautiful musical and story-telling recital which tells the story of Clara a young woman who became a nun. 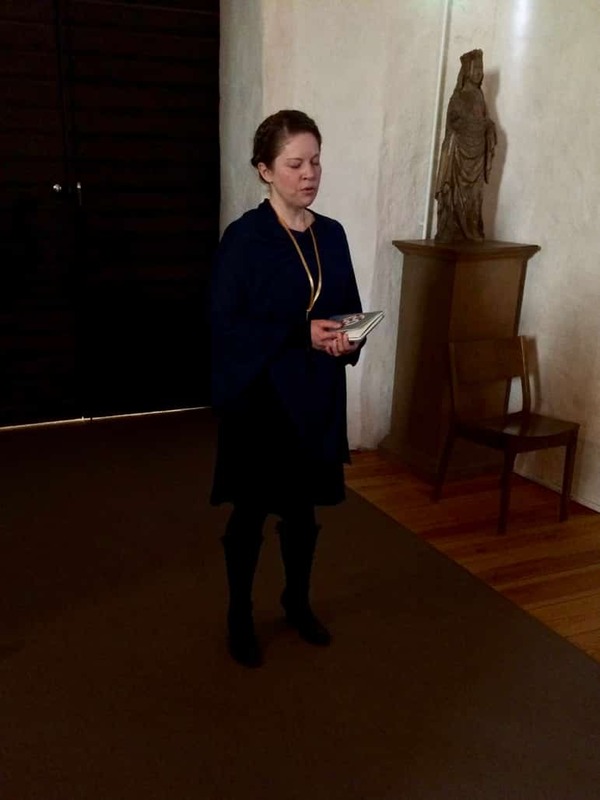 As we entered the church I thought I could hear Ave Maria the clear vocals of a music track being played across speakers, but instead I was surprised to see local guide, Larissa, using the building’s astonishing acoustics to her advantage – her voice clear as crystal. An hour and a half of music and narrative passed quickly amid the 15th century splendour of this medieval church. 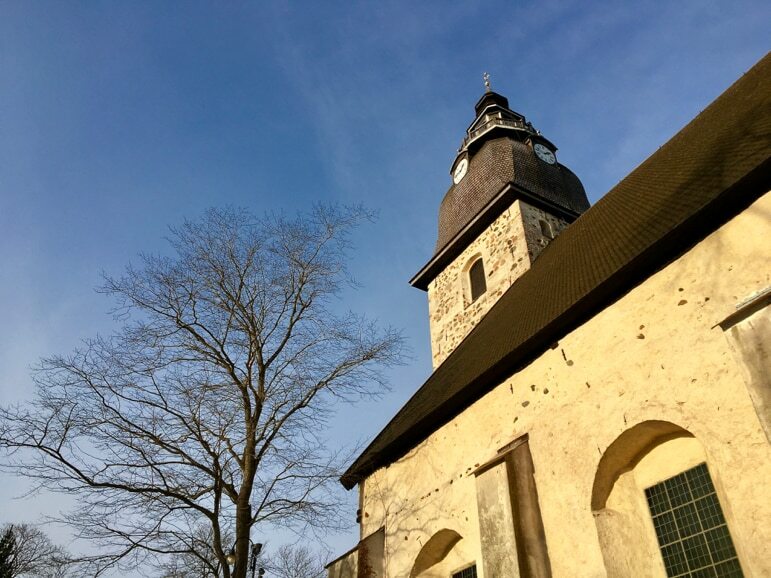 The Naantali church was built for the St Brigittine convent and is the second largest medieval building in Finland, however it no longer serves as a convent. Taking a song with us in our minds, along with a hard-to-describe sense of peace, we left Clara and her story behind for another relaxing stop. 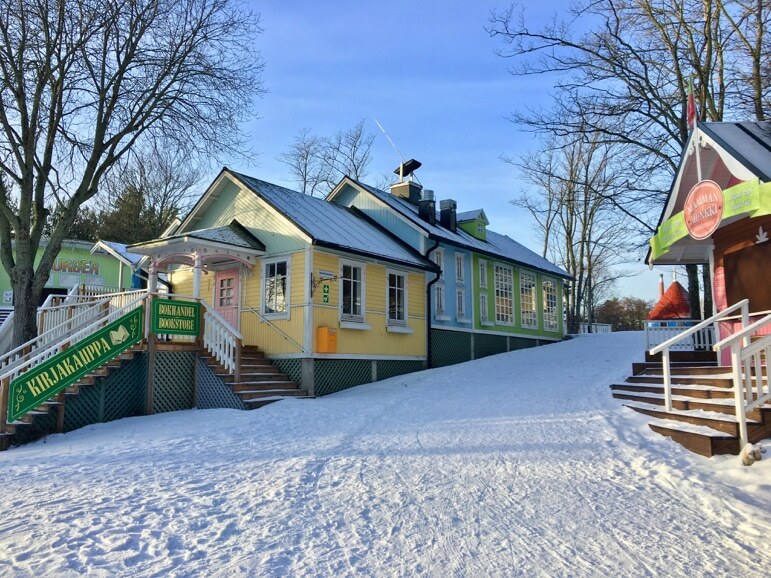 Herrankukkaro, is built on an old fishing village, on the shores of the Baltic Sea about 25 minutes drive from Naantali. It has an unusual name and an unusual claim to fame. Herrankukkaro translates as ‘Mama’s Pocket’ – a place of supreme comfort, the kind you’d likely expect to find in your own Mama’s Pocket. 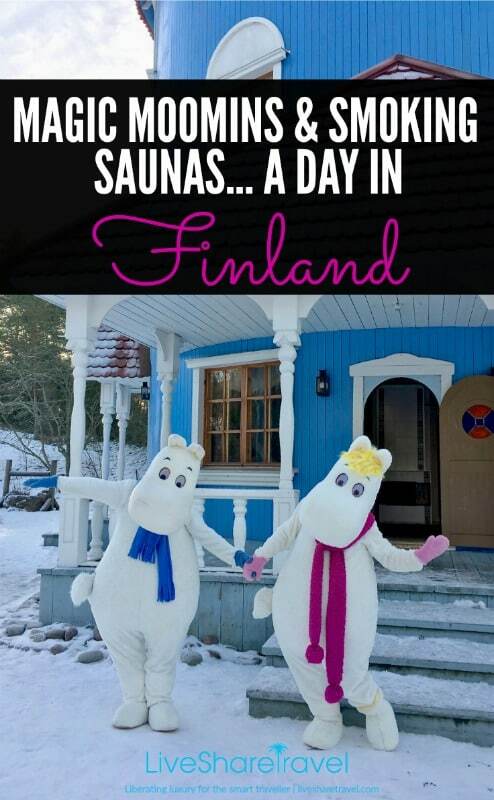 It is also home to the world’s largest smoke sauna, which can cope with 124 sweaty bodies all at once. 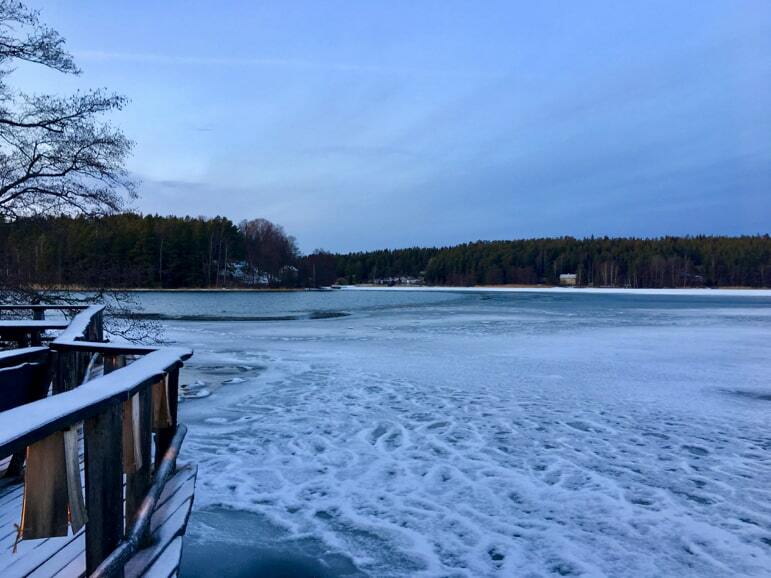 As we walked down the frozen, snowy path towards the sauna it felt a little like strolling through a timewarp. Old, dark, wooden buildings lined the way, and with the sea to our left and the forest to the right, we were in a natural wonderland. But a true delight lay ahead. We all got changed and stepped out into the sub-zero temperatures for the short walk to the gargantuan smoke sauna. Entering the dark interior the smokiness tinged our skin, swimwear and noses, but was not overpowering. The cavernous room has seen a full house, with parties and corporate events held in there – even bands playing to entertain groups of sauna devotees. But there were just eight of us, so we had plenty of room to stretch out and relax. 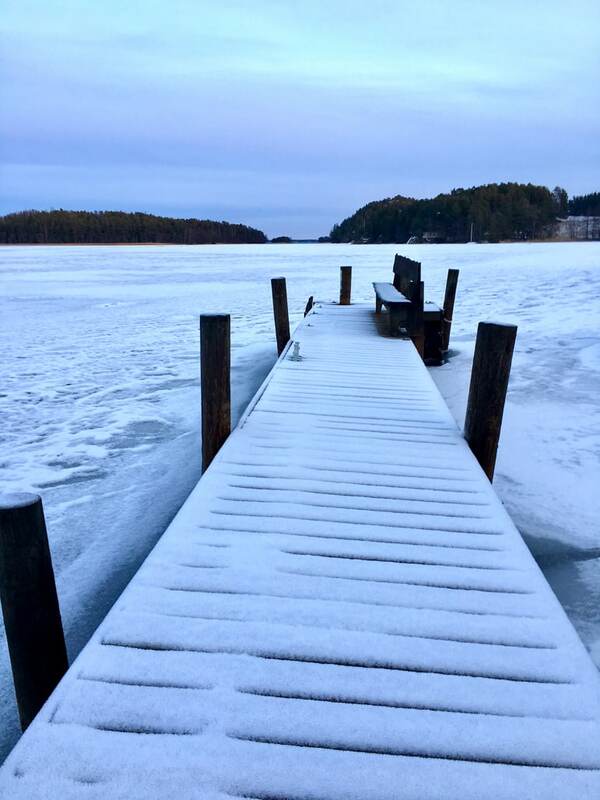 It’s tradition for Finns to finish their sauna sessions with a dip into the icy cold water of the Baltic Sea. 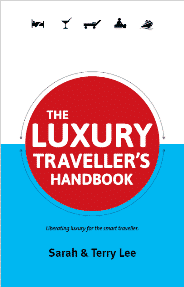 It’s definitely an adventure – something you have to do at least once in your life. 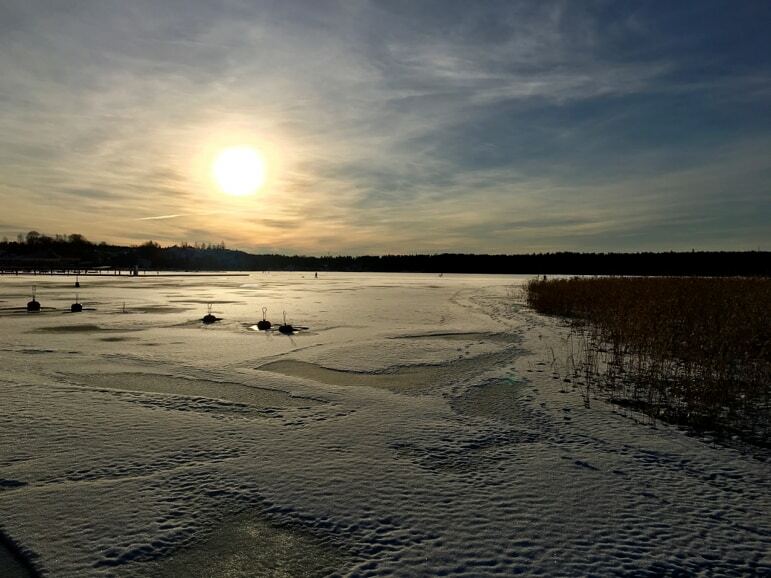 But as Sarah and I had already been ice swimming in Finland’s largest lake, we left it for others to erm, enjoy. We retreated instead to the warmth of the Jacuzzi on the deck, swigging back beers and long drinks (a popular local mix of gin and grapefruit juice) looking out over the frozen landscape as the day turned into a starry-dark night. If this is what it’s like in Mama’s Pocket, I’d happily stay there for a very long time. While in Naantali, we stayed at the Naantali Spa Resort. 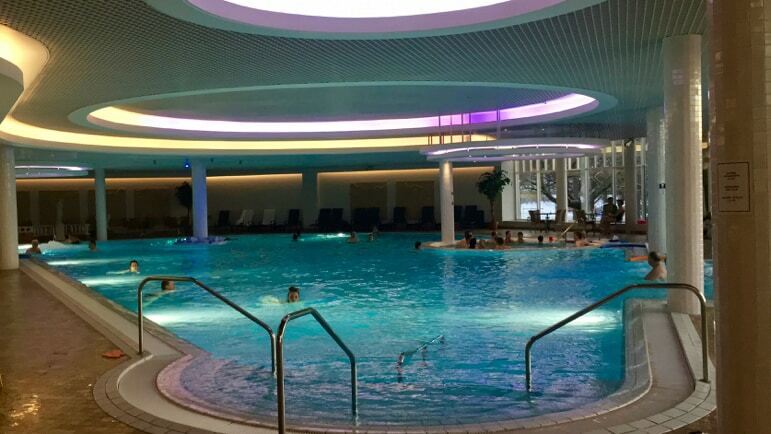 It is the biggest spa in the country and has saunas, Turkish steam rooms, Jacuzzis, indoor and outdoor swimming pools, a fitness centre and offers a great range of beauty treatments. We also dined there at one of the wide range of impressive restaurants. Check availability and prices at Naantali Spa Resort. 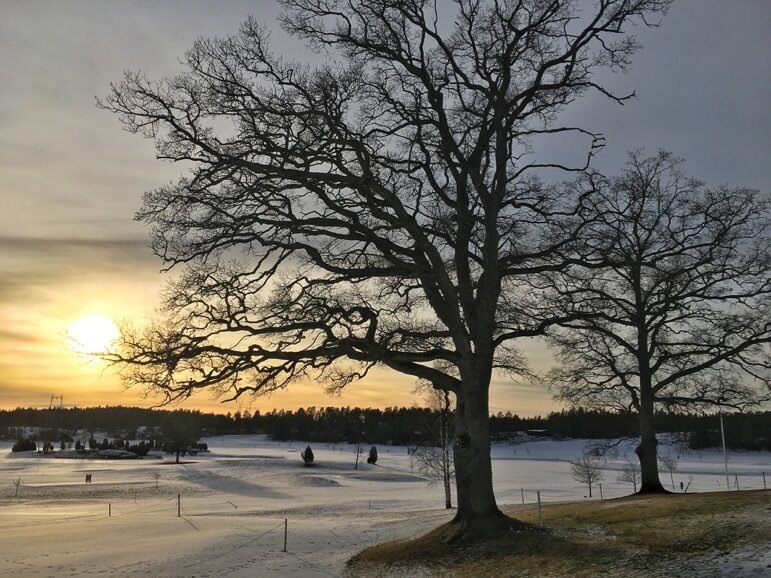 If golf is your thing, take a look at Kultaranta Golf Resort, which has a full size course, and is the newest wellness resort in Naantali – just 10 minutes drive from the centre of town. 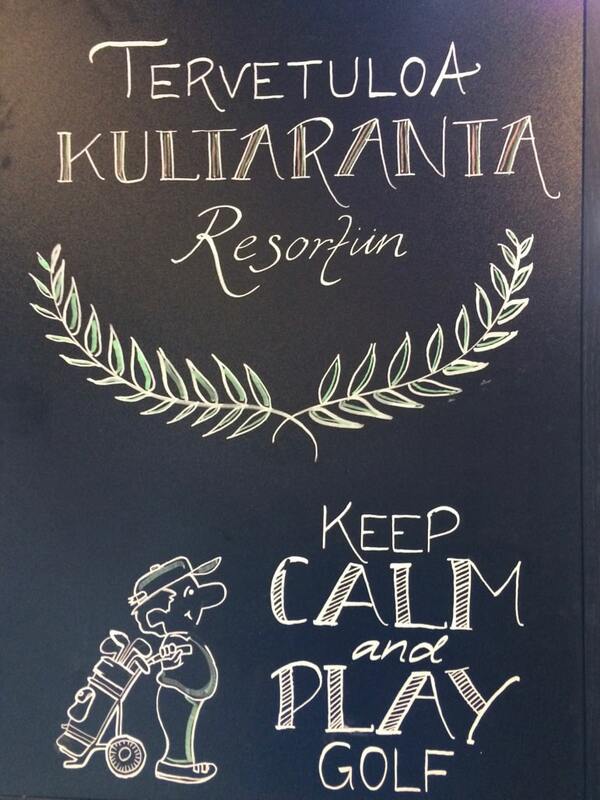 Check availability and prices at Kultaranta Golf Resort.